A while ago, I learned that you could make a lamp using olive oil and a half an orange. Today I discovered yet another use for a half an orange: to create a bird feeder. With a sharp knife, cut the orange in half – scoop out the flesh. Pierce 4 small holes on opposite sides, about 1/2″ from the top edge of each half . Thread one piece of twine through a hole, and out the opposite end. Repeat with the second piece of twine in the remaining holes (you’ll have an “X”). Gather the ends together and tie in a knot. Repeat with the other half. 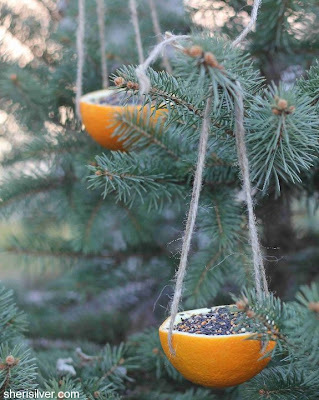 Fill with bird seed and hang from sturdy branches outside. Our 8 year old (who just a few days ago, was our 7 year old!) is going to love this hack, as he's asked a few times to put up a bird feeder (mostly out of concern that the birds have less to eat as winter approaches). In this same post, there's a recipe for creating a home made menorah. That's another little project he'll love as well. Via: sherisilver.com which was found via: bostonmamas.com.